A firmware update contains improvements to the performance of your Belkin router and could also resolve issues that the previous firmware version may have. This article discusses how to update the firmware of Belkin routers through the web interface. Connect your computer to the router using an ethernet cable for stable connection to prevent update failures. Upgrading through Wi-Fi may cause issues due to unstable connection. Consider backing up your router's settings before updating the firmware. To learn how to do this on your Belkin router, click here. The model and version number of your router can be found on the label at the bottom of the router. In the example below, the model number is F5D8236-4 and 3 is the version number. For more information, click here. You'll need to download the updated firmware file from the Belkin Support Site to your computer. For instructions on how to do this, click here. If you encounter problems downloading the file, you may use another browser or clear the cache of your browser. QUICK TIP: Belkin routers have the Save/Backup Settings and Restore Previous Settings features that allow you to back up your current router settings and retrieve the backed up settings. To learn how to do this, click here. Performing the update can be done through the router's web interface. 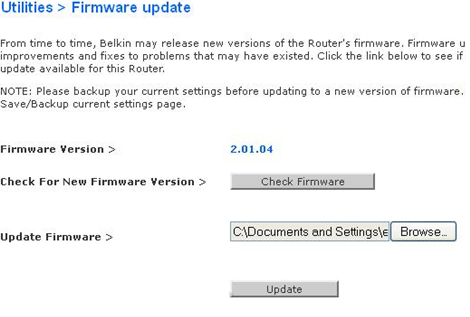 NOTE: If you are updating the router's firmware through the Belkin Dashboard, click here. Launch a web browser, enter 192.168.2.1 in the Address bar, then press [ENTER]. You may also use "http://router" instead to access the web interface. NOTE: The Belkin router's default IP address is 192.168.2.1. If using this doesn't work, check your router's IP address. For instructions, click here. Click Login at the top-right corner of the page. Enter your router's Password if you have one. Otherwise, leave the field blank then click Submit. On the Utilities section in the left navigation panel, click Firmware Update. Click Browse..., then locate and select the firmware file you downloaded. NOTE: For Mac® computers, downloaded files are usually saved in the Downloads folder. After selecting the firmware file, click Update. You will be prompted to continue with the upgrade. Click OK.
A prompt that advises you NOT to turn off or reboot the router at the end of the upgrade will appear. Click OK. The firmware update status will then appear. IMPORTANT: Make sure that you DO NOT INTERRUPT OR UNPLUG THE ROUTER during the update process. Once the update is complete, you will be prompted to wait for few seconds. Click OK after the router is done rebooting. NOTE: If you experience failure or see an error message when updating the firmware, powercycle your router and computer before running the update again. If this doesn't work, repeat the same process on another computer to further isolate the issue. If the issue still persists, reset the router to factory defaults and run the update again. You should now have successfully updated the firmware of the Belkin router. If the internet connection is lost after updating the firmware, you will need to restore the configuration that was previously set on the router. 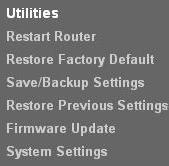 For instructions on using the Restore Previous Settings feature of the router, click here.